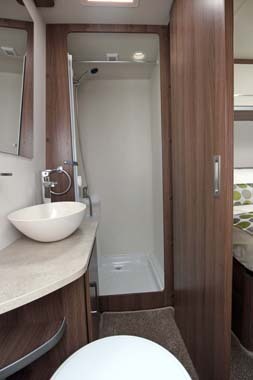 The Venus 570/4 has an end shower room, a transverse island bed and an offside centre kitchen. The square-shaped shower has a very useful hanging rail in the shower, a space-saving bi-fold door and is complemented by a new vanity unit which has a top-mounted, cream oval-shaped basin. The toilet is on the off-side and it’s all rather domestic-style, complete with one duct for the blown air heating system. A sliding door leads into the bedroom area with the island bed which measures 6ft long and 4ft 5ins wide. 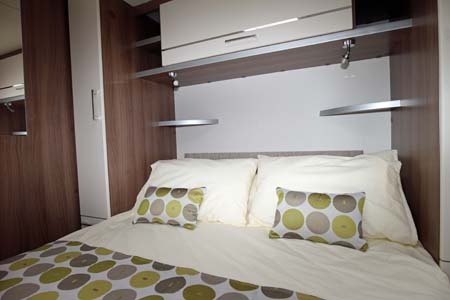 As usual in this layout, there are wardrobes and storage at each side of the bed, and there is a large over bed locker. Look hard and you’ll find a power point on the bed base, but there is also a wall-mounted dedicated television aerial point and power point. The area is heated with one heating vent. If you want to screen the bedroom from the kitchen/living area there is a concertina style door for this. The kitchen does have a surprisingly large amount of workspace, but this is created by the triangular shaped Thetford 3 burner gas hob set in one corner, which is complemented by a Thetford Duplex combination oven and grill. 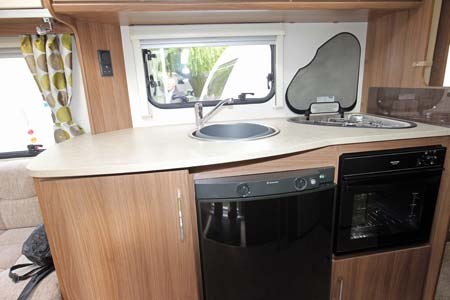 Worktops are a neutral colour, and match the light walnut woodgrain cupboard frames and carcasses and the magnolia cupboard fronts used throughout the caravan. The fridge door is a striking black. The living area is a standard, traditional layout with parallel seats and a chest of drawers between the sofas. If you don’t want to use the pull out table, there is a new, taller and lighter weight freestanding table for this model year. We visited this Venus on a cloudy day so really felt the benefit of the one piece large front window, which allowed what brightness there was to illuminate the interior, showing off the colourful curtains. 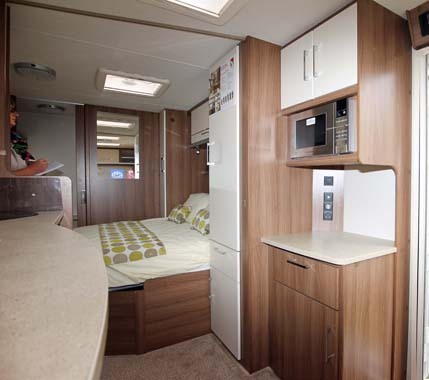 Green credentials include LED lighting throughout the interior and an LED awning light. Exterior features include new graphics and colours for the 2016 season. Verdict: Adding the optional Plus pack is a no-brainer. For £499.00 you get Multi-spoke Alloy wheels, AL-KO AKS stabiliser, a spare wheel and underslung AL-KO spare wheel carrier, AL-KO Secure receiver, an 800w microwave oven and an entertainment system of a radio/CD/MP3 player with iPod connectivity. It’s really hard to imagine not taking up this option; just add the AL-KO wheel lock and you’ll see the impact this will have on the cost to insure this Lunar caravan. 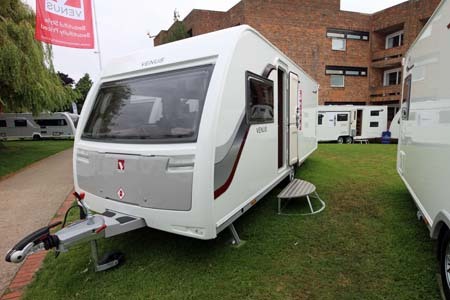 *Caravan insurance cost based on Lunar Venus 570/4 caravan retailing at £15,199 fitted with hitchlock and optional axle wheel lock. Kept on drive at HX4 0BE. Caravanners over 30 years old, claim free for 3 years and a member of a caravanning club. £100 excess. 180 days European cover and up to £75 per day for up to 15 days emergency accommodation cover included. Legal expenses cover, extended European cover and other emergency accommodation expenses cover options are available at extra cost. Quote includes 10% online discount and 6% Insurance Premium Tax and is correct as of 10th October, 2015. **Price is ex-works and includes VAT but excludes a recommended delivery charge of £525.00 including VAT to cover the cost of additional services e.g. delivery of the caravan to your retailer, before collection by you. 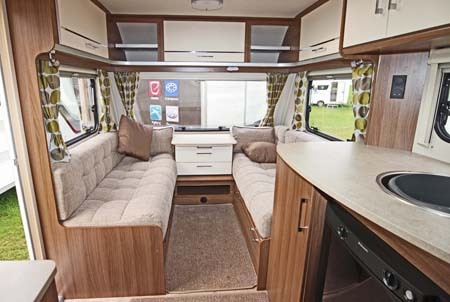 I have just ordered a 570 Venus and pick it up on Friday the26th of August if anyone has one can they tell me if they think they are good value for money. Like this so much we have one on order for March delivery. I noticed at Sat 17 th show that new lunar caravans.didn’t appear. to have any awning rail strippers on ends the rail was just cut off not straight either I think it looked terrible .& vans look cheaply made .the stoppers.give rail a finished look. and I would have though you could catch your hands on the bare ends. Hi Richard, Lunar caravans do not have stoppers on their awning rails but tell us that it’s not a common complaint from their customers. In fact Lunar has just enjoyed a really successful show! Thanks Richard. Glad you enjoyed the show and got chance to call by our stand.